If you have been reading our Singapore Food Blog & Travel Blog, you would know that we are a couple duo with the sole aim to take the world by storm. But while we love the fact that we get to travel the world with someone we love, there are certain downsides to traveling when it’s just the two of us. For one, if you look through our instagram account, you would realize that we are always taking pictures of each other instead of taking them together. If we wanted to take shots together, we had to either rely on selfies, front cameras, selfie sticks or bystanders, which honestly, none of which turns out well. It was a fact that we had overtime slowly learnt to get used to. It got so bad that on rare occasions when we finally got to travel with our family members who are able to take pictures for us, we actually felt awkward taking pictures together and just didn’t quite know how to pose as a couple. And while our solo pictures we take for each other still turns out relatively decent (or so we like to think), it’s really a sad fact when you look back at pictures and it’s not of the both of us. If you are anything like us, you would want to take pictorial evidence around the world with your loved one to serve as physical memories that you can look back and reminisce on. Well, all that changed for us when we chanced upon WanderZoom. WanderZoom is a vacation photography platform like no other we know. WanderZoom pulls together some of the best and most experienced photographers around the world and put them all together on one single platform. In essence, WanderZoom allows travelers like us to engage experienced photographers to take professional photos no matter which part of the world you are traveling to. Because WanderZoom only uses local photographers, these photographers would also have inside knowledge of the best shoot locations in a country that foreigners just wouldn’t know about. 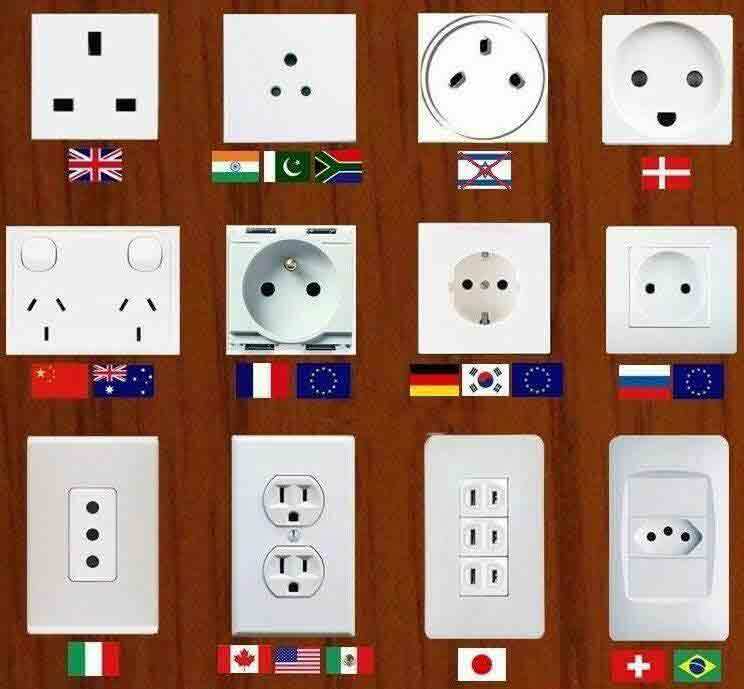 From Asia-Pacific countries such as Hong Kong, Korea, Taiwan etc to European Countries such as Germany, Portugal, Poland etc, WanderZoom has you covered. Bid pixeled front cameras goodbye and start creating beautiful memories of you and your love ones around the world with professional photographers by WanderZoom. Livelaughtravel.net recently got a chance to work with WanderZoom during our recent trip to Korea. 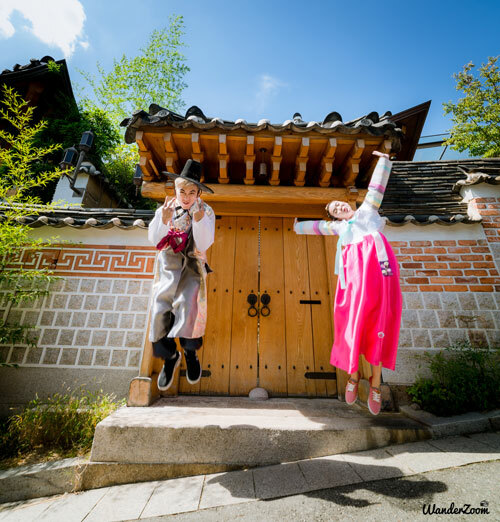 We have always wanted to try renting a hanbok in Korea and decided to engage WanderZoom’s photographer just for that. The photographer we worked with, Daniel, was extremely sincere and professional. 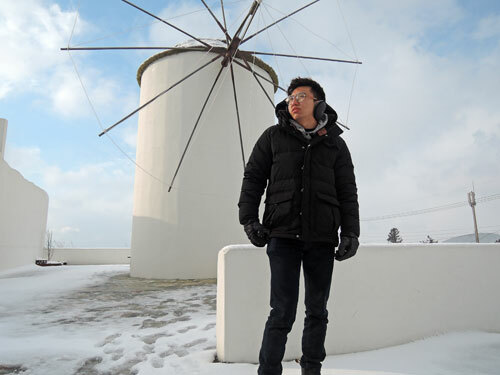 We had made our arrangement prior to even reaching Korea through WanderZoom. It was going to be our first time doing a shoot in korea and didn’t quite know where and how could we go ahead with it. 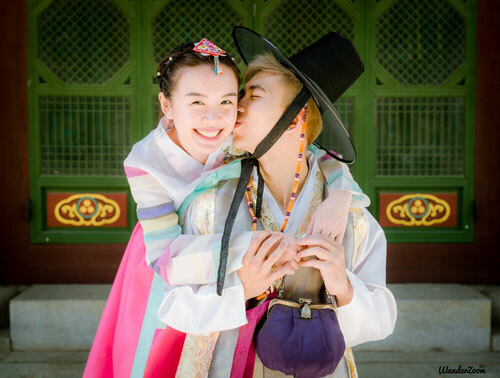 All we knew was that we wanted to do a shoot in a Hanbook (Korean Traditional Costume). It wasn’t much to go by,but Daniel patiently guided us and adviced us base on his knowledge and experience on possible places that we could do the shoot. We eventually decided to do it at Bukchon Hanok Village and scheduled to meet him on the Friday we were there. However, Daniel dropped us a whatsapp message on Thursday, explaining how he checked the weather forecast and it was forecasted to be cloudy the next day. He recommended pushing back the shoot to another day if our schedule allows. We heed his advice and through his actions, could feel his sincerity and professionalism, that he wasn’t there to just do his job and that he truly wanted to take good photos for us. On the actual day, we met Daniel after renting our Hanbooks at a nearby shop. He guided us to photo worthy spots and basically took charge of our shoots. Daniel was extremely easy to talk to as he shared his experience and background with us. Even though WanderZoom charges on a per hour basis, Daniel wasn’t gonna be the kind that stuck to the clock. He went above and beyond what was required of him and even though we weren’t exactly what one would call “model” material, did his best to guide us and help us take the best possible photos. We cant be more impress with how the photos turn out and cant be more thankful to Daniel and WanderZoom for making this happen. Even though this is a sponsored post, we would like to point out that we genuinely think that WanderZoom is an amazing service that fills a gap that travelers like us face on a constant basis. We personally can’t wait for the next time we get to work with WanderZoom again on our next travel adventure. If you would like to do your wedding shoots etc overseas, instead of flying your photographers overseas, you can also make use of WanderZoom to find local photographers who would be more than willing to come up with a special price package to do your wedding shoots. If you too want to read more about WanderZoom and get US$10 Off your first overseas photoshoot, click HERE. Alternatively, if you need more inspiration, you can always visit WanderZoom’s Facebook & Instagram account for more beautiful pictures.